My friend Leon and I were planning a meal for about a dozen people, so we cruised the Farmers’ Market looking for inspiration and ingredients. We knew we wanted a nice hunk of meat to roast, so we stopped by the Yolo Land & Cattle booth to see what beef was available. Yolo Land & Cattle’s raises some excellent grass-fed beef, just north of us in Woodland, CA. I’ve enjoyed a few cuts from them, and always been pleased. Given the number of people we were feeding, we settled on a nice seven and a half pound slab of brisket. 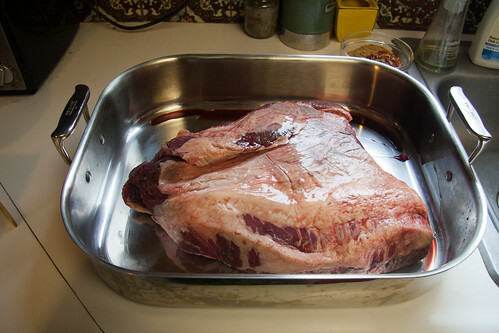 Brisket is something I usually leave to others who are more adept at it than I am, whether it’s Laurelhurst Market or my good friend Sarah, and I was a little nervous about tackling this. The only other time I’ve tried to make brisket was last Christmas, and while it turned out okay, it didn’t really achieve the proper tenderness until the second time I reheated the leftovers. Hoping to avoid that fate again, I carved out seven hours for the brisket to cook, and consulted numerous recipes before coming up with my plan. 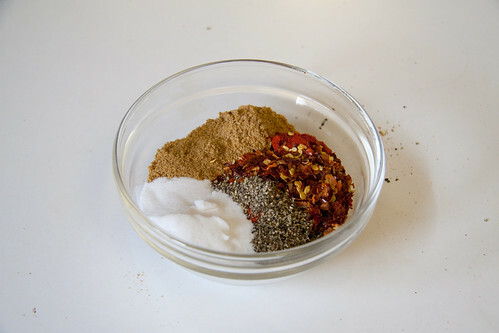 I placed the brisket fat side up in a large roasting pan, then covered it with a dry rub of salt, paprika, peppers, mustard seed, coriander and sugar. Next I added some knobby carrots from Fiddler’s Green to the pan, and placed it in the middle of the oven at 300°F. 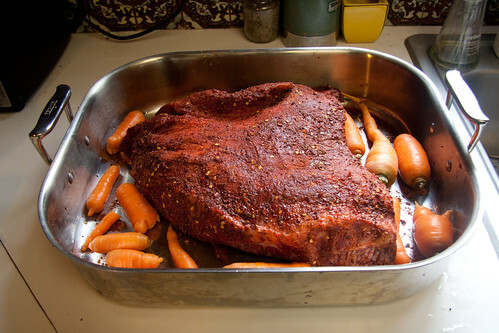 After about three hours, the fat was really starting to melt, and the brisket’s aroma filled the kitchen. I pulled it out, and flipped it over, then added about a cup of red wine to the pan and covered it with foil. 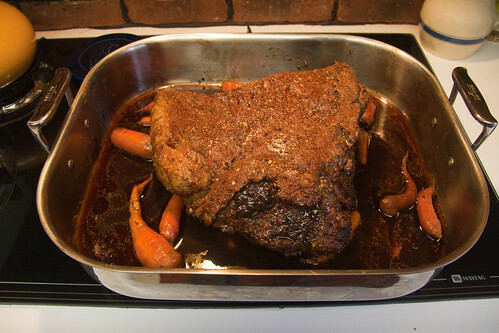 The brisket went back in the oven for close to four more hours. I pulled it out at 5:45pm when it had reached an internal temperature of 190°F. 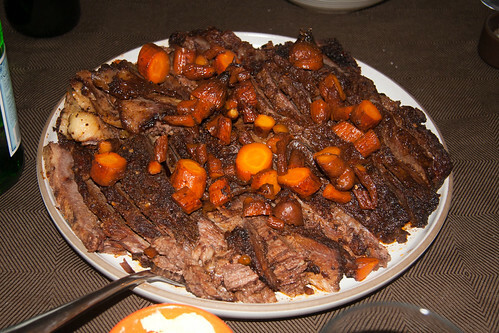 It sat covered for about an hour, while we prepared the rest of the meal, then Leon sliced it and the carrots and we reduced the pan drippings and drizzled some of them over the meat before serving. This brisket was tender and subtly spiced. It was especially delicious with a bit of carrot and potato on the end of the fork.